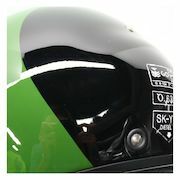 The Italian jeans company Diesel has teamed up with Italian helmet manufacturer AGV to produce a line of designer helmets. Diesel takes the helmet company in a different direction to their typical racing fare. The helicopter pilot style Hi-Jack helmet is dedicated to fans of customized equipment and riders who love life on the road while wishing to remain in line with the unconventional Diesel style. The attractive look, the range of chromatic variations in the graphics, rounded fit and the unmistakable curve at the sides develop the aeronautic design that inspires the Hi-Jack helmet even further. The helmet is completed by the concealable visors in different tints that let the helmet be adapted to the needs and style of each and every rider and make his or her look even more decisive and rebellious. 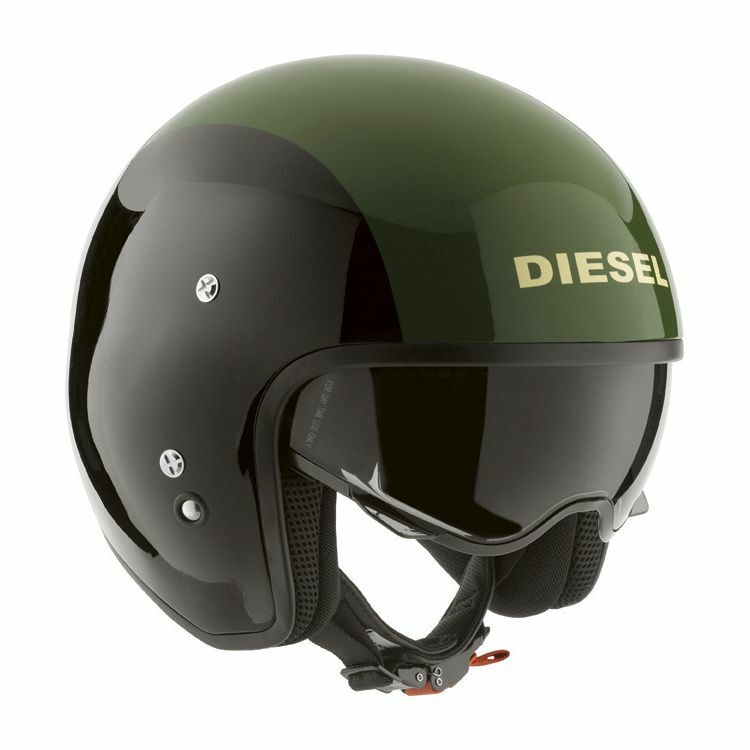 The AGV Diesel Hi-Jack was inspired by helicopter pilots, it is intended for those who want an original helmet that refuses to remain unnoticed. The aggressive look, the graphic colors, and the domed ear cups accentuate the new "aerospace" design that inspired this helmet. Note: Diesel Hi-Jack Helmet ships with clear face shield only. This is my first open face helmet and I feel like I'm missing something ... the rest of the helmet maybe? Where do I start? The helmet felt like it was being pulled off my head by the wind. I don't have goggles. I couldn't stop my eyes from tearing. Should I have goggles? The sizing is off. I have Shoei and Schubert helmets in large. I got this helmet in large. It feels too big. I guess I will only wear it for really short trips until I figure out the other gear needed to use it for regular riding. Great Product. Fits great. Low noise level. Great pad. I had one of the first AGV Diesel helmet's and liked it a lot but the new ones are evern better. Padding has been improved and the face shield is better. Will buy another one if this one wears out. The design is a work of art ... fits the Cafe style perfectly and looks fantastic ON THE SHELF. Put it on and unless you are of a LARGE stature, it looks huge and bulbous ... almost ridiculous. I want to wear this helmet, but being 5' 11" / 175 pounds ... I just cannot bring myself to go out in public wearing this thing. Too bad given they nailed the helicopter pilot look perfectly. Love the helmet. Very nice!! I never pick the ordinary when it comes to style and features. This helmet gives me the freedom of a half helmet with the protection and ear protection I wanted. The drop down eye protection is also helpful for those long rides and when it rains. It gets looks wherever I go and the quick release chin strap is convenient. This is a beautiful helmet with excellent fit and finish. Unfortunately I had to return it as it was uncomfortable with my prescription eyeglasses no matter what I did. I ended up getting a Shoei Platinum RF instead which is extremely comfortable with eyeglasses. I gave it one star as it was unusable for me with glasses. Otherwise it was a five star as far as the other attributes. Great helmet for the money.